I haven’t written a post in a while. I have been writing many things lately but my heart has been heavy and burdened. I had stayed away from posting during this time because I needed to think about how to address some topics of burden that I was writing about before posting them here. As you probably know by now, if you have been to this site before, I parody the things that especially bother me. I don’t do this to make fun of anyone. I definitely venerate the Word of God! I do parodies to over-exaggerate. It has been my experience in life that over-exaggeration UNBLURRS the lines that are continually blurred and that so many are confused about. It takes away the “I wonder if . . . ” or “I think . . . “ and replaces it with “Well, if you put it that way . . .” type of moments. I want you to understand something before you read the rest of this post – it hurt me to write it – A LOT! It is not humorous nor is it meant to be. 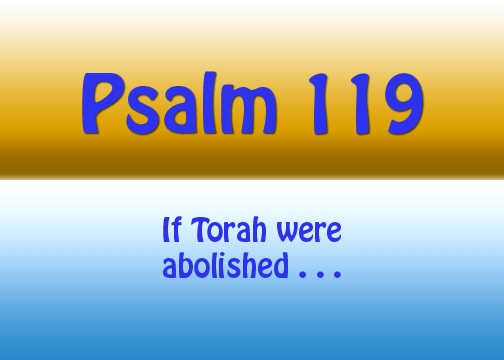 I have taken the Word of God and inserted parenthetical statements that one would have to make if they subscribe to theology that teaches that God’s instruction (His law – Torah) has ended. 1 How happy are those whose way of life is blameless, who (are no longer are required to) live by the Torah (instruction-law) of Adonai! 2 How happy are those who (no longer have to) observe his instruction, who (no longer have to) seek him wholeheartedly! 3 They do nothing wrong but live by his ways (as long as you don’t call it a law or a command). 4 You laid down your precepts for us to observe with care (but now they are no longer required). 5 May my ways be steady in (no longer) observing your laws. 6 Then I will not be put to shame, since I will have (no need anymore to have) fixed my sight on all your mitzvot(commandments). 7 I thank you with a sincere heart as I learn your righteous rulings (that I no longer have to obey them). 8 I will (not) observe your laws; don’t completely abandon me! 9 How can a young man keep his way pure? By guarding it according to your word (as long as it doesn’t require obeying your commands or laws). 10 I seek you with all my heart; don’t let me stray from your mitzvot(commandments) (which I can’t anyways since they are no longer applicable to me). 11 I treasure your word in my heart (as long as it isn’t the law), so that I won’t sin against you. 12 Blessed are you, Adonai! Teach me your laws (so that I will know that which I don’t have to follow anymore). 13 I proclaim with my mouth all the rulings you have spoken (are no longer required). 14 I rejoice in the way of your instruction (that no longer applies to me) more than in any kind of wealth. 15 I will meditate on your precepts and keep my eyes on your ways (by not obeying the law). 16 I will find my delight in (not needing to obey) your regulations. I will not forget your word (is no longer required). 17 Deal generously with your servant; then I will live and (not) observe your word. 18 Open my eyes, so that I will see wonders from your Torah (instruction-law) (that no longer apply to me). 19 Though I’m just a wanderer on the earth, don’t (forget to) hide your mitzvot(commandments) from me. 20 I am continually consumed with longing for your rulings – (please take these from me). 21 You rebuke the proud, the cursed, who (no longer) stray from your mitzvot(commandments) (because they are no longer required). 22 Remove scorn and contempt from me, (because I no longer need to) observe your instruction. 23 Even when princes sit and plot against me, your servant (no longer) meditates on your laws. 24 Also your instructions (that are fulfilled and no longer needed) are my delight; they are (no longer) my counselors. As you can see, I did not do all 176 verses. I see no need to go any further, nor do I want to. Quite frankly, if you don’t see how utterly in contradiction to God’s word this theology is in these first 24 verses, then you more than likely won’t see it at all no matter how many verses I were to parody. It is my prayer and hope for you that if you subscribe to “the law has ended” theology, that this short post causes you to reexamine what it is that your are really stating to God by accepting that theology. I worship the God of our fathers in accordance with the Way (which they call a sect). I continue to believe everything that accords with the Torah and everything written in the Prophets. and teaches others to do so will be called the least in the Kingdom of Heaven. But whoever obeys them and so teaches will be called great in the Kingdom of Heaven. I choose option 2!!!!!! It is my hope and prayer that you do as well!!!!!!!!!! Peace be with all of you – Shalom! This entry was posted in Parody - Writings and tagged Adonai, christianity, even if, God, instruction, law, parody, psalm 119, torah, Yeshua. Bookmark the permalink. Hard to deny the truth. Great work. kind of painful to read – kind of hard to understand how people can come to these conclusions – kind of makes sense why so many that call themselves believers live such unbelieving style lives – Adonai forgive me when I take your word casually and forgive them too . . .